Our "Christmas Cuvée" began in 1986 with a truckload of fruit from Clockspring Vineyards. These grapes had been harvested at 21º brix and were very juicy, because it had been a wet growing season. In order to concentrate the flavors and produce the dry red wine he had intended, Steve drained off 55 gallons of juice and fermented the remainder with skins and seeds. Ever practical, Liz inquired what he intended to do with the extra 55 gallons of juice. Steve's response was to ferment the extra juice into a blush wine for the Holiday season. He approached Tom Bender at the City Hotel and Restaurant in Columbia Historic State Park and Tom agreed to take 10 cases of the newly named "Christmas Cuvée" for the holiday season. Steve next approached Ken Bergot at the Sierra Hills Market in Murphys and he agreed to take the final 10 cases to sell during the holidays that year. So, with the wine still unfermented Steve had sold the entire first vintage of his "Christmas Cuvée". 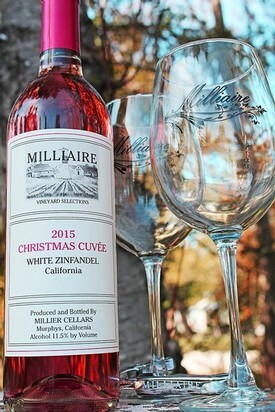 Now, we do a limited release of our new White Zinfandel just before Thanksgiving every year and it is labeled "Christmas Cuvee".